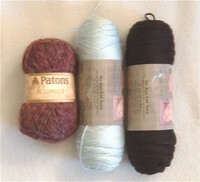 Yarn: Simply Soft in black and soft blue. 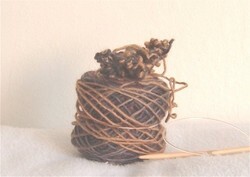 Less than a skein per color was used. Size: Four and half inches wide and just under four and half feet long. Time Served: After a few false starts, five days. Mods: I worked up the chart while using the blue as my main color, and did the checker board part before working down the chart using black as my main color. I guess it's a kind of ying and yang scarf now. Techniques: Tubular cast on, double knitting, binding off without making that end of the scarf look wider than it should be. Lessons Learned: I am a much double knitter than I was when I started this project. I had tension issues due to using needles that were too big. I went down to the size 6 needles and the knitting because better/easier. I hate this yarn and if I ever do this scarf again, I will use wool. It would be a much nicer scarf if it could be blocked. I used the yarn for ease of care as it is going to live with my boy, and his momma never taught him how to block. He also picked the colors. I feel like I'm a much better chart reader now. Not sure I should feel that way, but I do. Again? : Maybe. While working on it, I thought never again. However, I think I'm changing my mind. I tend to fall in love with things once they're done and I can hold/wear them. That said, I'm glad it's done. LaurieM over at Issues with Knitting made me do this. Please forward all complaints to her. Thankies. Cast on with this yesterday to make gay boyfriend a hat. Did not like how quickly the color changed from grey to brown. Am rethinking this. 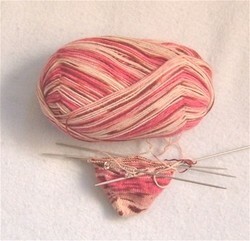 I'm toying with the idea of using two balls at once to get the color repeats to be long enough. The grey lasted long enough to around once. Not good. I need more grey... or grey and that reddish color. I think the brown will wash him out and we can't have that! It's going to sit there while I ponder. Yeah, I think way too much. It's the return of the cardi! Yeah, I'm not real excited about it, either, at this point. It's not like I'll be finishing it in time to wear this fall... considering it's fall now. Loving the basket it lives in more doesn't help much, either, btw. I'll get back to it once I'm done with that double knit scarf. If I ever do this one again, it will be in the round. Going back and forth is part of why it's taking me so long. Yes, add lazy knitter to my list of sins. I don't mind. Opal yarn that is slowly growing up to be a toe-up sock. It's from the RainForest collection... flamingo. I love this yarn. The colors make me happy. Using US1 DPNs. At the rate, I'm going, I'll be done about a month after I'm dead. *L* But I'll be dead with cute happy socks. Yes, it is what you think it is... only in towel form. Something simple that I can work on while doing other things. Yes, I do need to be doing something at all times. Annoying, isn't it? Only having to count to five while working on it is a blessing at time. Like today when it's very windy and I'm not good for much. I can still knit and slip the occasional stitch. I had to cut the yarn and restart Sunday. Turns out that I cannot follow a chart while crying. I should have known that. 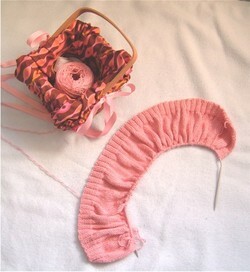 It was easier to just cut and restart than to try to tink back six rows of double knitting. Trust me. I think I'm doing pretty well right now. Trapped in that middle area of checker board knitting. The pattern calls for the checker board repeats until you have the length you want. I'm going to work on the checker board stuff for a while to get the length it needs. Then I will reverse the colors and follow the chart down to the end where there is nothing but the main color... but in black. If it works, it should be pretty cool. Gotta say, like the pattern/chart and think it would be a great scarf in wool. 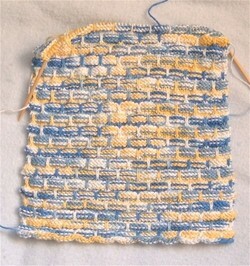 Using the Simply Soft is making me sad because I can see how it would look better if it could be blocked. Can't block plastic yarn, though... and it had to be this yarn because it needs to be machine wash and dry for the boy. Breaks my tiny black heart. Last night, I ripped back the double knit scarf and started fresh with the help of kitty, who felt the need to lay on the pile of yarn made from frogging the scarf. I really would be lost without all of her help, ya know. I do realize that all relationships have some kind of compromise to make them work and/or keep them working. I do realize that occasionally the compromises needed to keep things going can be somewhere between less than ideal and downright dreadful. I do realize that both sides have to compromise... even if Mistress doesn't wanna. I do realize that compromise is the grownup thing to do and someone my age should not be pouting over this. Yeah, the slightly out of focus thing that isn't really black and white. That thing. We hate that thing. More than is healthy, in fact. Double knitting makes me tense. I have to knit very tightly so that the fabric will look alright and not have huge gaping holes in it... cause that would be bad. So tense that my jaw is still aching from clenching it while I was double knitting yesterday. I still have the headache from it, too, and my hands still ache. Oh, and I worked on it for less than two hours. I hope not cause this thing is killing me. Oh, I've got your compromise... I am honestly thinking about knitting that scarf twice and sewing it together so the one I love can have this double knit scarf without me having to actually make a double knit scarf. What's stopping me? His mother knits. And the funny part... cause there's always a funny part... ? This is the first knitting project I have ever considered just walking away from. Yes, I hate it that much. We hate that Patons Rumor. Looked like a white persian had rolled around on my hat in progress. Needless to say, frogged, wound and shoved in my stash. I'm thinking about what I'm going to do with it. Maybe make something for someone I don't like who is allgeric to alpaca or something. 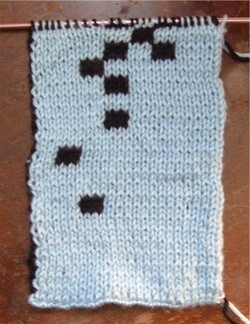 The baby blue and black are Simply Soft for the boy's double knit scarf. His momma never taught him to block. Yes, I really went there. I have PMS, the cat flu and icky yarn in my stash. Ya'll have no idea what it's like over here. Anyway... while I am not much a drinker, that thing is going to drive me to drink. I googled for a tutorial on how to do a cable cast on and figured it out. Gave myself and the boy a headache in the process, but he needs to suffer once in a while and I'm not there to see to it... Upon figuring it out, I realized a couple of things. I am heart-stoppingly stupid and it's a really good thing that I am not having children. It was shortly after that happened and was fixed (restarted... yes, again) that I decided to take a break and play with some of Dave's lovely lace weight yarn.